Fresh Fava beans, also called “broad beans” are in season now and can be found in their pods, at your local farmer’s market. I planted several rows of favas this year. They are just at the beginning stage of producing and too young to pick – maybe another week or so. In the meantime, Melissa’s had them available sent me fresh pods this week to use in my recipes. I remember my mother making a delicious simple stew with them with a few pantry items. Today, I thought I would start out with a very simple recipe so that you can shop for some at the market and try them out for yourself. Plan ahead for shelling and blanching the beans before cooking. 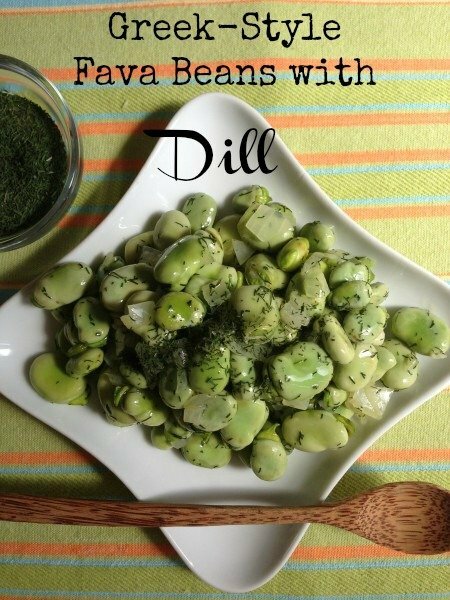 Try this simple method of cooking fava beans and you'll be pleasantly surprised at how delicious they can actually taste with a touch of fresh dill. Bring a medium pot of water to a boil over high heat. Shell the fava beans, discarding the pods. As the water boils drop in the beans for 2 minutes until outer skin loosens. Drain and set aside until cool to touch. Pop the fava beans out of their skin and place them in a bowl. In a saucepan heat the oil and saute the onion and garlic until soft. Add the fava beans and cook 2-3 minutes. Add enough water to just cover beans. Stir in dill, salt and pepper. Cook, covered, 10 minutes or until beans are tender. Remove the lid and continue cooking until all the water has been absorbed. Tip #1 Favas are a tough bean and need to be blanched to remove the outer skin. Tip#2 When shopping for fresh favas look for young green pods that aren’t bulging which indicates age. Tip# 3 In cookbooks favas may be listed under broad beans, horse bean or faba. They can be substituted for recipes calling for large lima beans in soups, casseroles, and stews. Fresh Fava pods and a look inside! © 2013 – 2015, Mary Papoulias-Platis. All rights reserved. I love fava beans. Your recipe looks perfect as they don’t really need much. Cathy, this is my favorite go-to recipe! I hope you try this with the dill, it adds a little touch of Greece to the dish!